Last week I had done a cute little hanger with cupcakes. Behind the cupcakes were pleated circles. I had some requests to do a little tutorial on how these were made. It's very simple really. In today's Challenge #24 Red, White & Blue I've added a video below to show how I made those cute pleated circles. I hope you enjoy. Today's project is another hanger, this time using the Framed Flag and the God Bless America with Stars. I used chipboard for stability behind each piece. The Framed flag was stamped using distressed ink, Faded Jeans and Fired Brick. When mixing two different inks, start with the lighter of the two colors if you can. I stamped the God Bless America using the same ink. I added ribbon for hanging and a few stars to finish it off. This would also be great with the Eagle Pair stamp. Thanks for checking out my Red White & Blue...Now show us yours. This weeks prize is...hmmm...I'll have to get back to you on that later today. This last week we've had some great projects and cards. I really loving giving birthday cards...and I have a lot of family with upcoming birthdays...so this was a good challenge for me. Today I used the winning stamp set, Birthdays and Balloons. Love love love the dogs. This has been one of my favorite sets to play with. 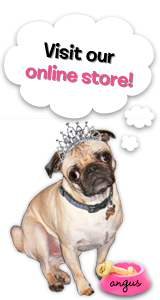 There are so many occasions that a dog holding a balloon would be so perfectly fitting. The inside was stamped with my favorite stamp of the set, the balloon holding pup, and colored with water color pencils. His balloon was colored with Promarkers, then cut and pieced over. Hope you enjoyed this little card today. Don't forget to show some love to our design team for all their wonderful posts this week. Congratulations Denimo, Send your contact info to smiles4126@aol.com and we'll get that right out to you. Check back tomorrow afternoon for another fun challenge. Have a great week! 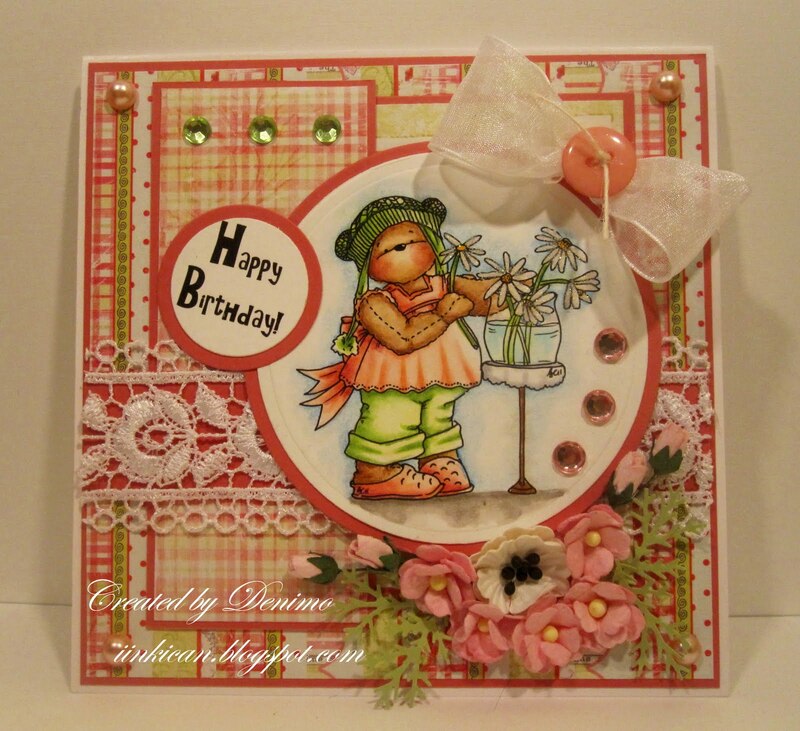 Speaking of celebrations this weeks challenge has a "Birthday" theme and with this 4x4 card I had hoped to portray the idea of opening a present. I used a double sided paper and made a cross slit in the middle and folded it back, like opening wrapping paper. Well thats what I was aiming at, of course if it's anything like me opening presents I should have torn them open LOL. I stamped the white space in the middle with a cupcake from the Hey Cupcake set colored the base with copic markers (alcohol ink markers like ProMarkers) and applied liquid applique and sparkles to the cupcake top. I popped up the birthday sentiment with foam squares and I distressed the edges of pretty much all of it. 3 little gems add some sparkle and voila a scrumptious zero calorie cupcake surprise. 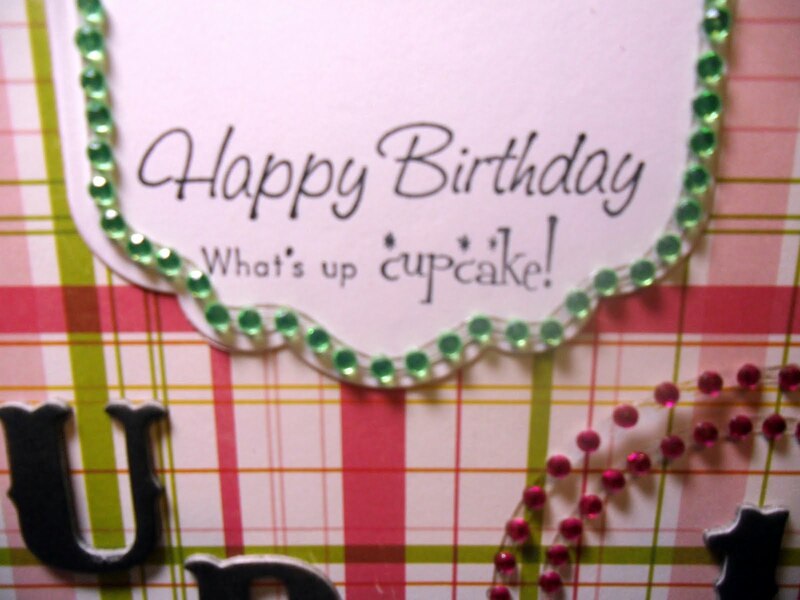 I have a birthday card today for this week’s Birthday challenge. I’m using the prize set – Birthdays and Balloons – one of my all time favorite The Rubber Café sets. Sooooooo cute! :) So you really should take the chance winning it!!! All details about the challenge can be found HERE! I have summer feelings and that calls for bold happy colors. 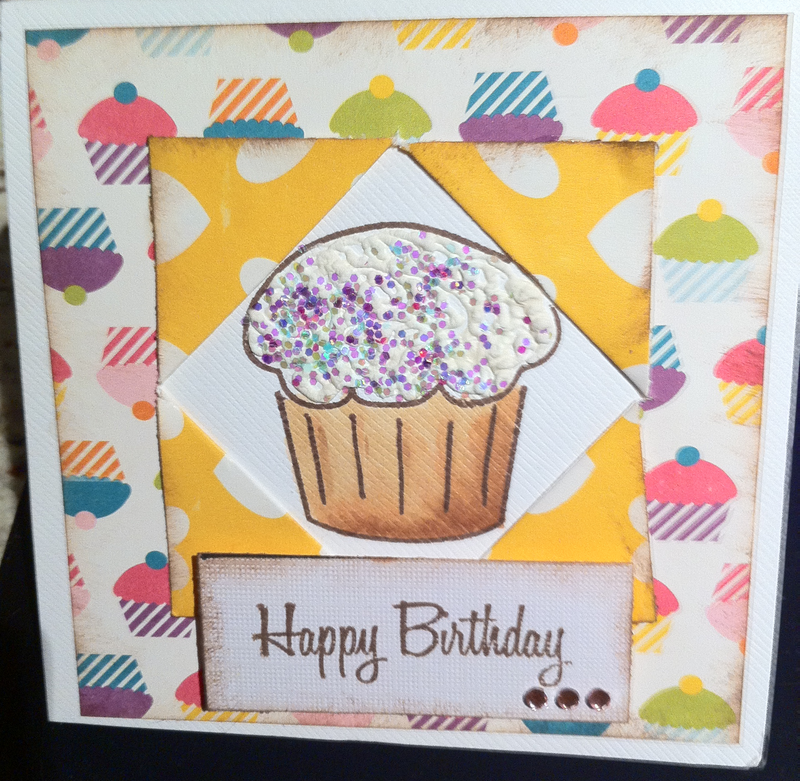 The dog and cupcake are stamped on water color paper and colored with Distress ink and then cut out and glued down on a Spellbinders circle for some dimension. The card is based on Card Pattern’s sketch #121. I hope to see your take on our Birthday challenge. See you next week!!! 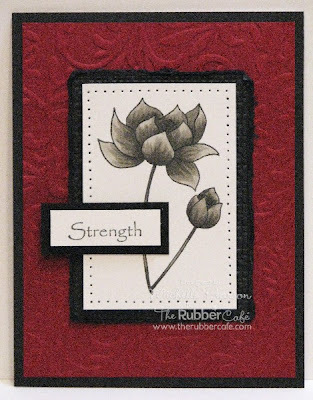 I had so much fun last week with the Asian Floral set from The Rubber Cafe...I kept right on playing with it for this week and have three more cards to share with you! For my first card, I changed up the color scheme and stamped the images tone on tone, and accenting each with coordinating markers. I pretty much kept this one monochromatic. I fussy cut out one flower and one dragonfly. The dragonfly is accented with a touch of glitter. 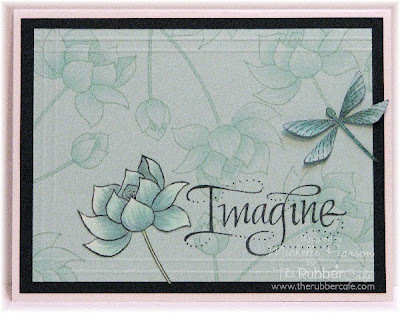 I used the beautiful Imagine sentiment, which makes this card fit in perfectly for this week's Rubber Cafe Challenge which is birthday cards. Happy birthday to me tomorrow! My age shall remain a secret!! I have seen images colored in shades of brown or grey...and decided to give it a whirl with this image. I liked the effect, and went with a bold and striking color combo for this card which could maybe be used for a sympathy or get well card. A touch of piercing and distressing were my only embellishments. And finally for this card, if you know me at all, you know I love to use up every last thing I stamp...and so I used up the strip of green background paper that I created last week and simply changed the layout and color scheme a bit. This card could be used for an anniversary or other life step moment. I used a bit of faux stitching and piercing to finish my card. I hope this card trio has given you a bit more inspiration using this gorgeous Asian Floral stamp set. We hope you pop by and join our challenge!! Well hello you beautiful weekend! Boy am I glad to see you. This week has been crazy here at my house so I’m so glad I still found the time to get crafty in my studio. That is the ONE thing that keeps me sane. 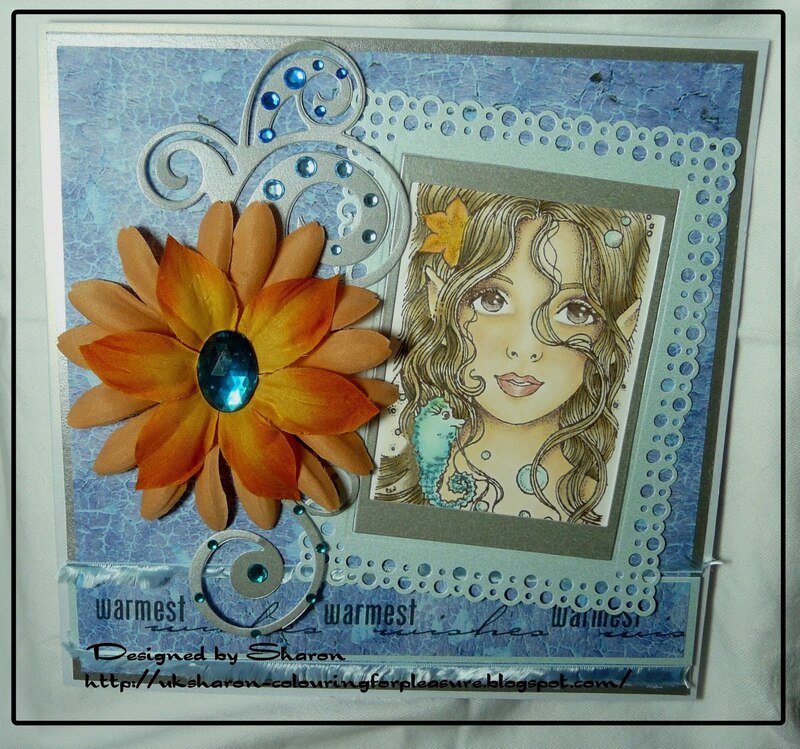 My project today goes along with our birthday theme this week and uses the BEAUTIFUL Be Stylish (Corset) stamp set. I decided to create this tag card for a friend of mine. Yes it’s a tag AND a card! Isn’t the detail on the Be Stylish stamp set amazing???? 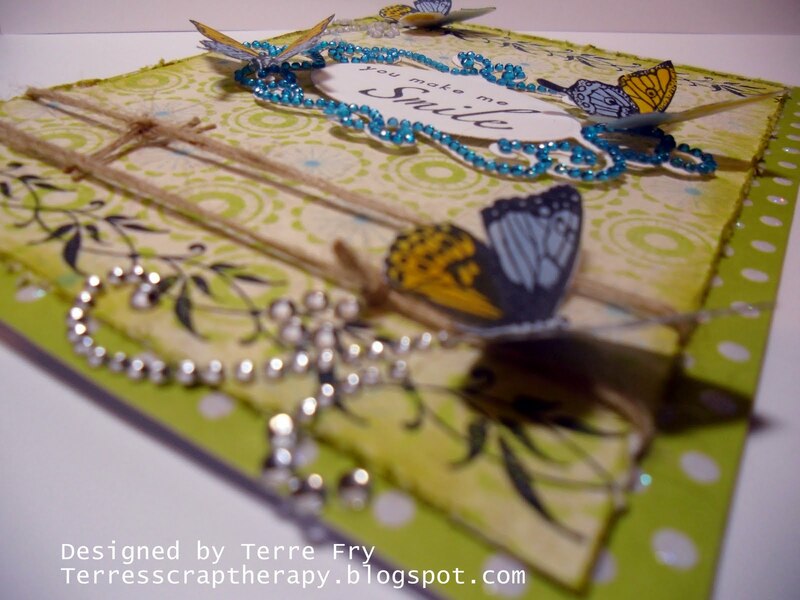 I turned this little tag into a mini card that you can attach to your gift bag. 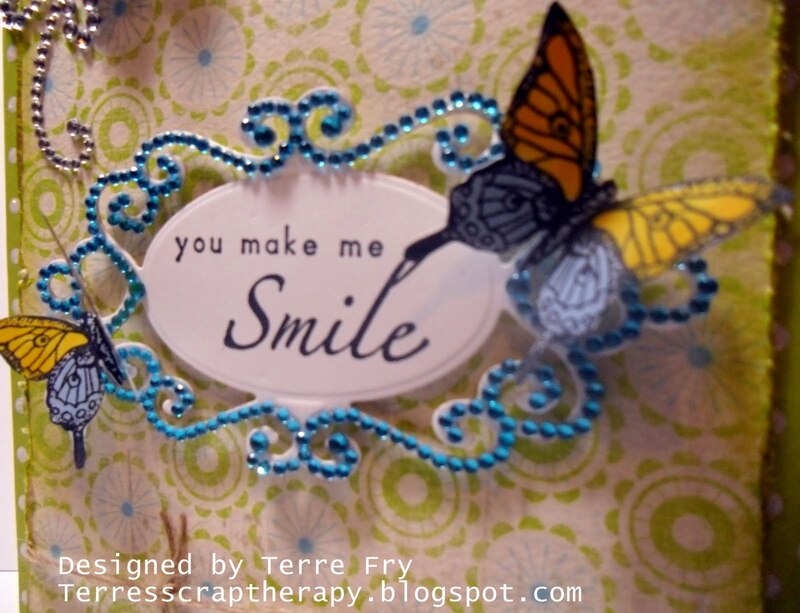 If your friend is a crafter they can simply cut off the card backing and use it in their next project as well. 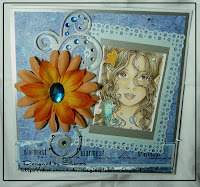 My inspiration for this tag was of course from the Tim Holtz Adirondack inks, the stamp set, and my need to play with water! Yes I did say water . . my water brush of course!!! SO MUCH FUN! If you’ve never used your water pen with Tim’s inks you have to try it. Simply dab your inks onto a slick surface. 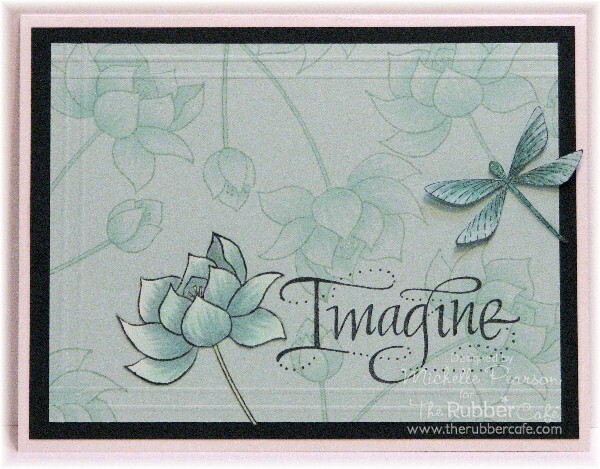 I used my large acrylic stamp block. Then use your water pen to pick up the ink and color away. It’s really that easy and not messy at all. I also watered down some pretty Lumiere paint and used that to add some shimmer to the finished piece. It really sparkles. You can see it a little bit in the bottom right corner of the photo below. Then I topped the corset off with some Want2Scrap Baby Bling Pearls and the saying with Amber Rhinestones, added my sentiment that comes with the stamp set, and accented the corset with some stickles. I also used dimensional adhesive and beautiful lace trim to put it all together. I hope this inspires you to create a birthday card tag for that special person in your life. . . and get those water brushes and inks out. You’ll have so much fun! Wow where did this week go? 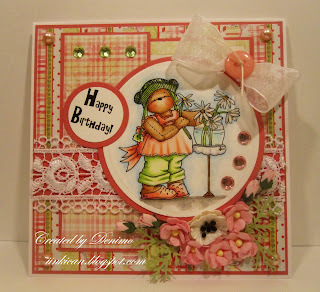 This weeks challenge was to create a project with a Birthday Theme. I had these cute pictures of my Niece..."Little D"....one of these days I will have to remember how to spell her first name so I hope my sister isn't viewing this post...sorry!!!! With my stamps in one hand and my ink pad in the other I created this layout using The Rubber Cafe S-102 Hey Cupcake stamp set...love it!﻿ I used only four stamps out of this 20 piece stamp set...can you believe you get that many stamps in one set...wow! I added many elements to my layout, Echo Park Little Girl collection of pattern paper as my base, Best Creations Inc. Glitter Polka Dot Paper machine stitched to my base. I die cut S4-246 Labels Eleven from Spellbinders™ using my Grand Calibur™ stamped the The Rubber Cafe S-102 Hey Cupcake sentiments to the die cut after I cut it in half. I added the Want2Scrap™ Nestabling™ Labels Eleven Green Rhinestones. 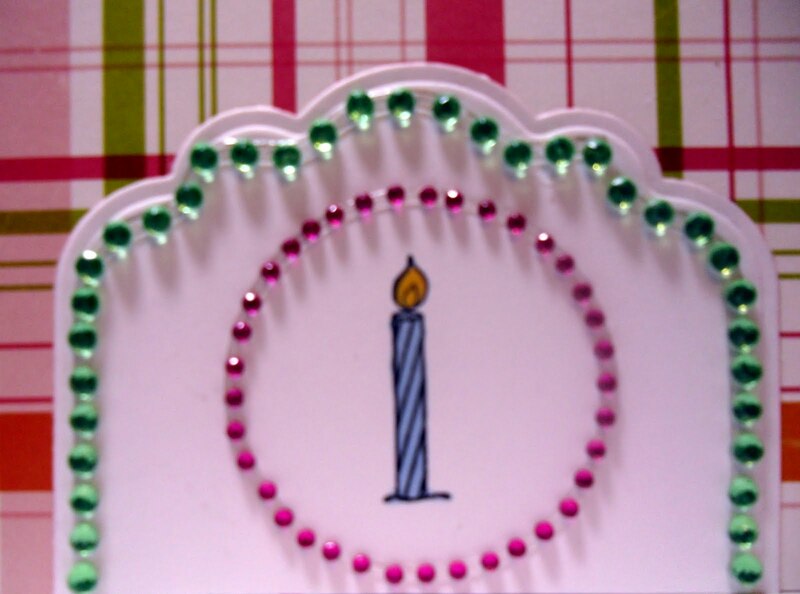 I stamped the candle and colored it with Copic Marker, added Nestabling™ Labels Eleven Green Rhinestones and one of the Nestabling™ Heart Circles Hot Pink Rhinestones around my stamped candle to create a rhinestone frame. Nestabling™ Heart Circles Hot Pink Rhinestones created frames around the chipboard. Using the cute little cupcake stamp The Rubber Cafe S-102 Hey Cupcake, I created a border just under my photos. I colored the cupcakes with Copic Markers and mixed Beacon Adhesives Zip Dry and Your So Fine Diamond Glitter to create my frosting on my cupcakes...don't they look cute? 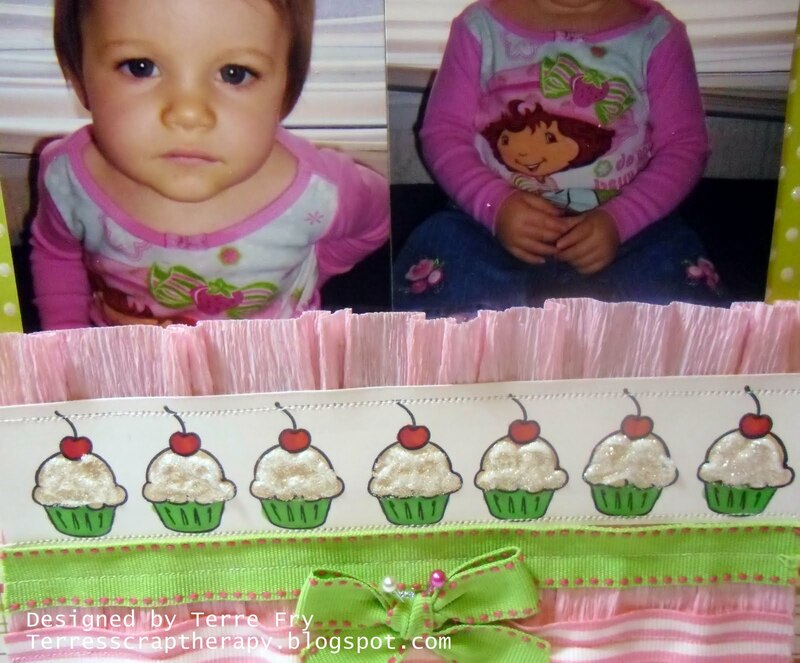 I machine stitched pink crete paper and lime green and pink/white striped ribbon from Want2Scrap™, tied a bow and added stick pins to the bow. It's not my birthday...but if it was...I would want something like this. It was a little hard to photograph, but I really enjoyed making it. The pleated circles were done with the Scor-Pal and Scrap Happy glue glots. Want to know what I'm talking about when I say "glots"? Check out this video that Melissa did a while back. The rest of this banner is pretty simple. The cupcakes, from Hey Cupcake, were stamped and cut. The base of each cupcake was crimped and the top was covered in glitter using Scrap Happy Glue and Couture glitter. Each square is assembled on chipboard for stability. 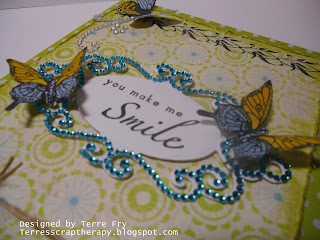 Thanks for stopping by and checking out my sample for the Birthday Challenge. 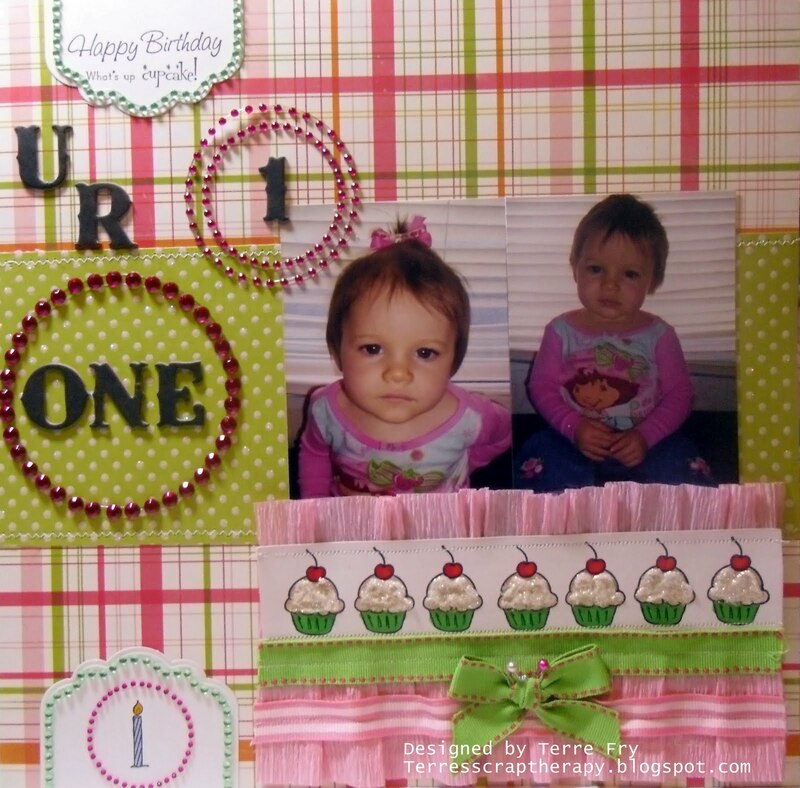 Now...it's your turn...show us your Birthday cards and projects. One of my favorite summer fruits is watermelon...yum! Around here...summer means the sun is shining, the grass is green (well...ok...the weeds are green in my yard), and the watermelon is sweet. I've added Daisy Bouquet in the backdrop. The ribbon is some miscellaneous scrap...not sure where it came from. 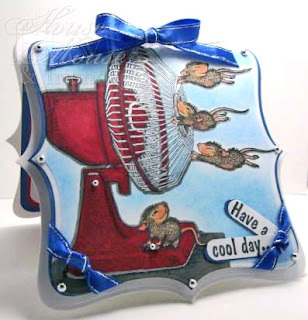 the background was embossed with Birds and Swirls from Cuttlebug. The circle was die-cut then trimmed to fit the mat. I used one of the new sponges that I received from Melissa called "lil' inkers" (love, love, love them!!) and inked up my paper with aqua ink then stamped the bottom with a stamp from Background Basics 1. The watermelons, from the Fruit Medley set, were colored with Promarkers and the base was paper pieced with some green scraps I had hanging around. I added You're So Fine glitter using Scrap Happy Glue and added dimensional adhesive to pop them up. The Fruit Medley set also has a great sentiments to go with the different fruit, but Fabulous Phrases or Just Because would also make great additions to this card. This week has been a great challenge week. The comments are fabulous and the participation is wonderful. Our design team really loves hearing from each and every one of you. Thank you so much for taking the time to enter our challenges and comment on the blog. Those House Mouse mice just crack me up. Congratulations America...send your contact info to smiles4126@aol.com and we'll get your prize right out to you. Thanks again to all of our readers. Check back tomorrow for another great challenge and another great prize. I created this card for our "Summer" challenge, I made a pocket to hold little note tags that I thought could be used to write down different summer memories. After making this I think it would have made a great scrapbook page element. I used bacground basics 2 on the notecards, Card Labels for the title and Small Cherries on the inside. I used a border punch to decorate the edge of the pocket. It's almost summertime and we're celebrating at The Rubber Cafe! Our challenge this week is to make a card that reflects summer! I chose to go with images from the Asian Floral set. I stamped the floral image on the cardstock in coordinating ink and then accented it with a coordinating Copic marker. 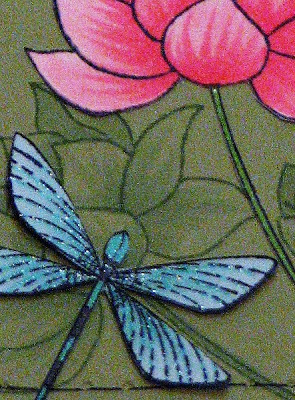 I colored and fussy cut one of the flower images as well as the dragonflies. The dragonflies are accented with Spica Glitter Pens and shown below. I kept my card clean and simple which is what this set seems to me. I hope it makes you think of summertime! Please join us for our challenge....check out the rules and the prize information on the Rubber Cafe Blog. Well its a beautiful warm sunny day here in San Diego ... Tomorrow we are heading to a 93rd birthday party ... I better get cracking on a card . Mrs Walters used to be a card maker herself ... so every year I try to out do myself .... last years card was pretty spectacular .... For now I am taking the afternoon off and heading out for lunch with Reggie and taking the dogs to the beach. This weeks challenge is Summer themed cards and I have been working on them ... I was surfing around the other night and found two really cute ideas I would love to give them credit but I can not find where I saw the cards ... sometimes when I am out in blogland I get lost ... for these cards I used old school Rubber Cafe stamps and you have never seen them before ... we will be putting these up online for a limited time only while inventory lasts we only have a few . Michelle asked where all the blue comes from when I take my pictures ... here is my back drop .... If you take pictures by your Pool be careful I have lost a few cards this way . I’m so pleased to be joining you this Saturday for my first the Rubber Café card. 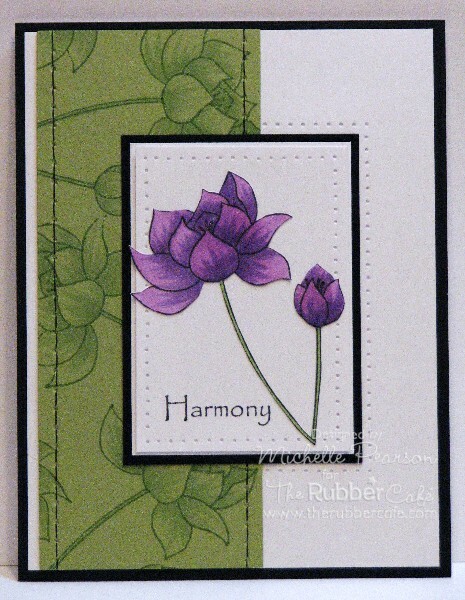 For this summer card, I used the Thinking of You stamp from the J-1095 Fabulous Phrases set for my sentiment. I just love the elegance of this stamp set. 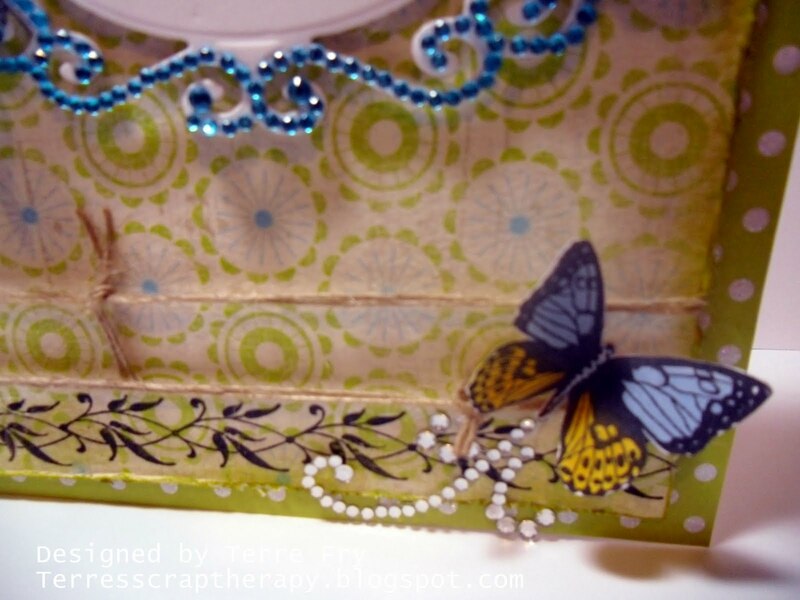 I think it goes so well with the Want2Scrap™ Nestabling™ Labels Fourteen and Spellbinders™ Labels Fourteen #5. I used dimensional adhesive to pop up the sentiment and surrounded it with some handmade velvet flowers. Stitching was added to the edges along with a few beautiful 72 Count White Pearls at the top and a tiny little baby bling to dot the “I” in the center. Thanks so much for stopping by. I can’t wait to see how you use your sentiments this summer. Happy Friday Everyone! I hope you have had a wonderful week and are ready for another creative Friday with me! For your viewing pleasure I have this bright and colorful Summer time card that just makes me smile "wink" "wink"! 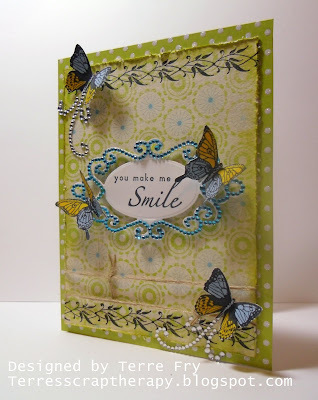 This card was created using some of my favorite stamps,-1141 Butterfly Set, G-718 Vine Border and J-1095 Fabulous Phrases all from The Rubber Cafe! I colored the butterflies with B91 and Y18 Copic Markers and attached them to my card using Beacon Adhesives Zip Dry.﻿, I added a Silver Rhinestone Finesse Swirl from Want2Scrap™ to create a swirl from the butterflies. The pattern paper that I used is from the Abby Road collection from My Minds Eye (love it) and the green polka dot pattern paper is from Best Creations Basic Glitter Paper, I thought they went nicely together. I added a little bit of twine to the bottom of my card and stamped the vine border in black ink to make the card pop. I stamped my sentiment on the S5-030 Fancy Tags Two from Spellbinders™, using the Grand Calibur™ I cut and embossed the die cut and embellished the die cut using the Nestabling™ Fancy Tags Two Blue Rhinestones from Want2Scrap™, doesn't that bling sparkle just make the Fancy Phrases pop right off the card?